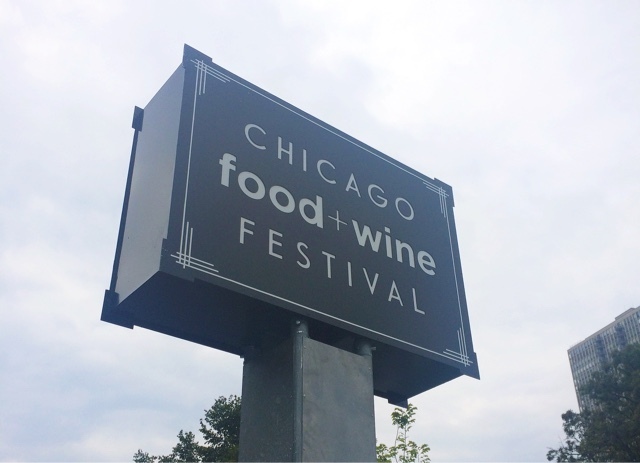 The weekend before last I had the privilege of attending the very first (of hopefully many) Chicago Food + Wine Festival and I can't say enough good things about the event. From the location to the layout to the variety of chefs and vendors represented, everything was spot on... If only they could have brought us a little sunshine! A little rain didn't stop us from enjoying the event to the fullest though. 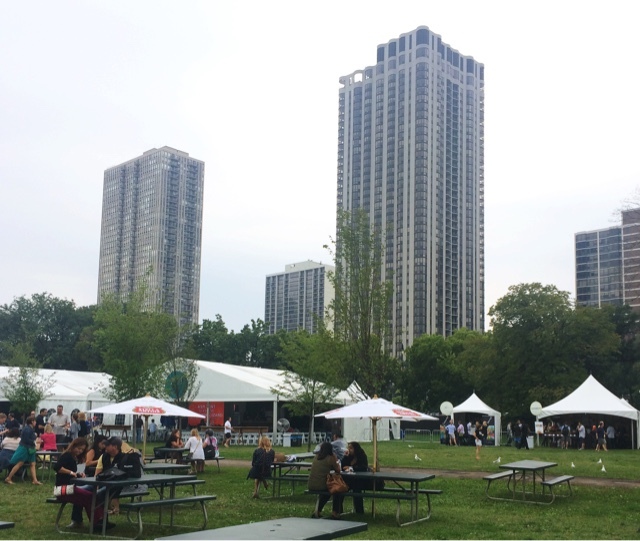 2015 was the very first year for Chicago Food + Wine and I certainly hope it will be back. The festival was held outdoors in the heart of Lincoln Park and was the brainchild of Charlie Jones, founding partner of C3 Presents (who have produced both Lollapalooza and Austin Food + Wine Festival), acclaimed chef Tim Love (of restaurants like Lonesome Dove Western Bistro and Woodshed Smokehouse) and Christina Grdovic, SVP/Publisher of Food & Wine magazine. Throughout the weekend there were 30 different cooking demos and guided tastings that took place throughout the festival. 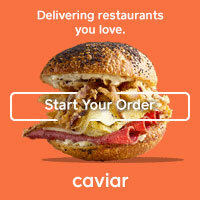 Many featured famous chefs and wine experts from Chicago and throughout the world covering a variety of topics. 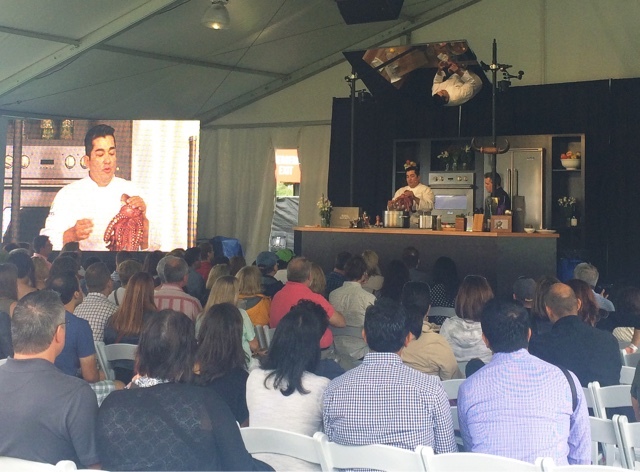 We managed to catch some of chef Jose Garces's presentation "There's More Fish in the Sea." Check out that octopus! Event sponsors and vendors had great interactive kiosks and tent set up all over the park. 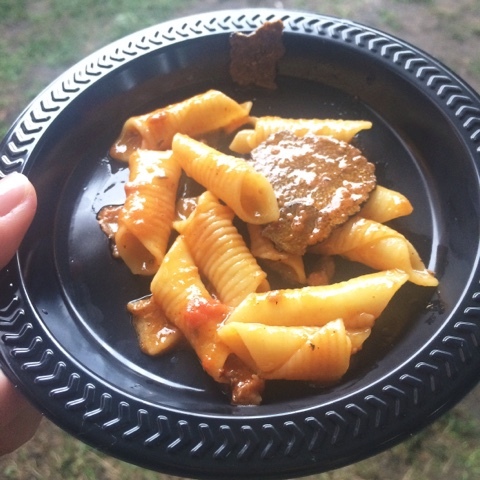 Stella Artois was hosting a beer and food pairing at theirs and we also stopped by the Renaissance Hotel's tent for a blindfolded taste test. Dark Horse Wine had one of the cutest setups at the entire festival. 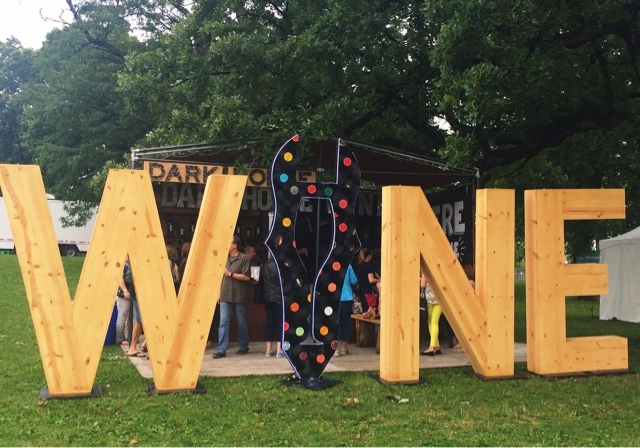 Their tent featured wine tasting (of course), a professional chalkboard artist, and this enormous 'WINE' sign that made for some amazing photo opps. My favorite part of the festival was the Grand Tasting & Chef Showcase, which took place throughout the duration of the festival. Saturday and Sunday each featured their own lineup of chefs, beverage vendors, and sponsors with over 90 total participating that weekend. 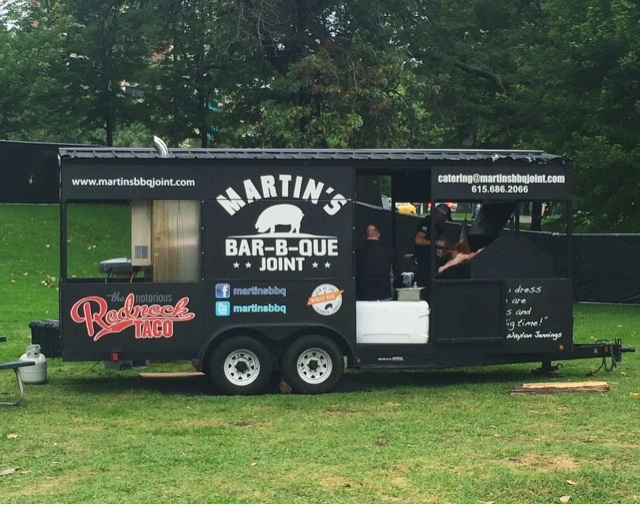 The Martin's Bar-B-Que Joint truck was on site straight from Nashville. 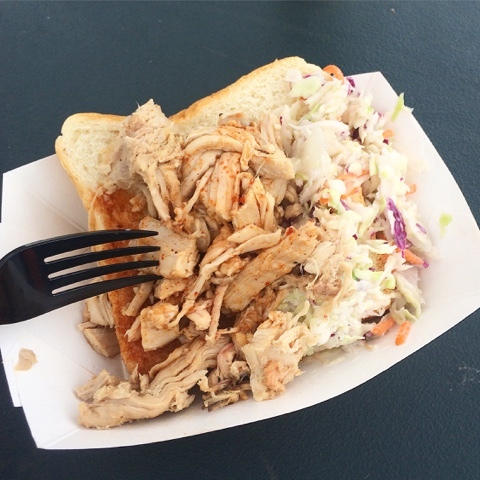 Martin's was serving up tender pulled pork with a tangy vinegar-based barbecue sauce and a heaping scoop of coleslaw-- all on a thick slice of white bread, of course. One of the coolest parts of the Grand Tasting was seeing some of the top chefs in Chicago in action right in front of us. Many of them were excited to chat, meet fans, and share information about what they were making and their newest projects. 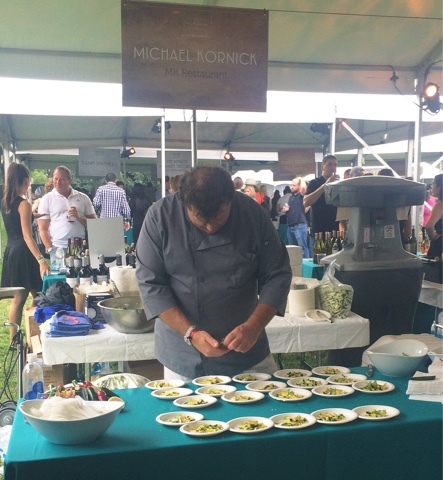 Chef Michael Kornick of MK Restaurant made this fresh and summery zucchini salad. It was super simple, but the flavors were wonderful-- with a little acid, a little heat, and some toasty breadcrumbs on top. 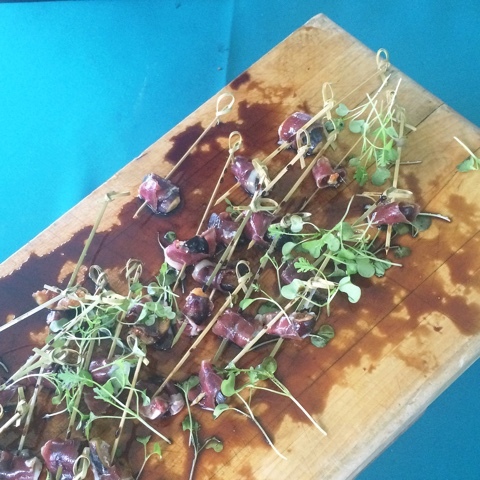 River Roast was serving roasted figs wrapped in duck prosciutto. These simple bites had amazing flavor and I loved their rustic and beautiful presentation. One of our collective favorites of the day easily went to Hoosier Mama Pie Company, who was offering a "DIPie" concept at their station. 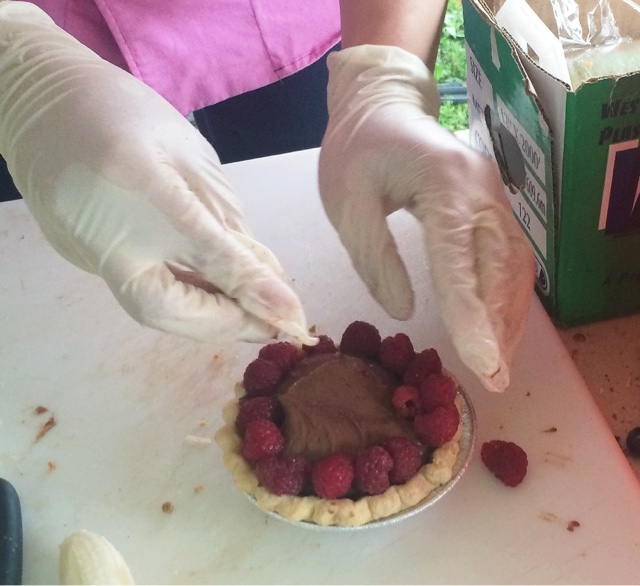 Hoosier Mama was offering three different kinds of pie crust (traditional pastry, chocolate, and gingersnap), 6 different filling options (from cherry to chocolate creme), and about a dozen different toppings. Each of us got to build our own pies to suit our tastes and came up with completely different and delicious combinations-- and Hoosier Mama took the time to make them all look so pretty! 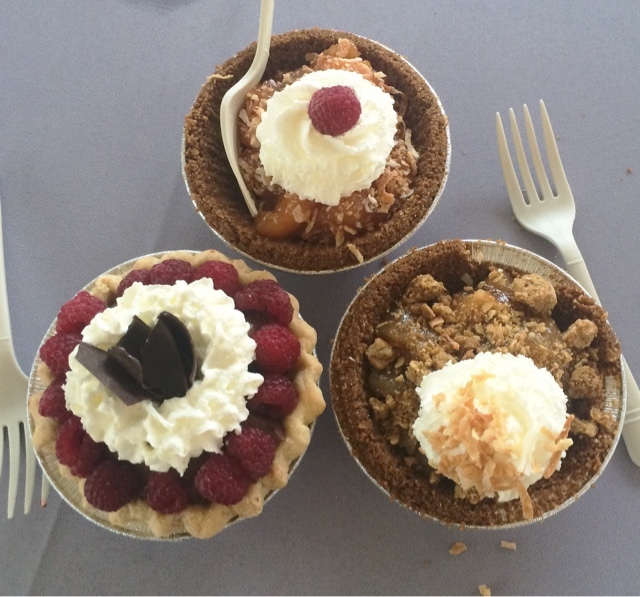 Mine is the pie on the bottom left: A gingersnap crust with apple pie filling topped with oat crumble, whipped cream, and toasted coconut. 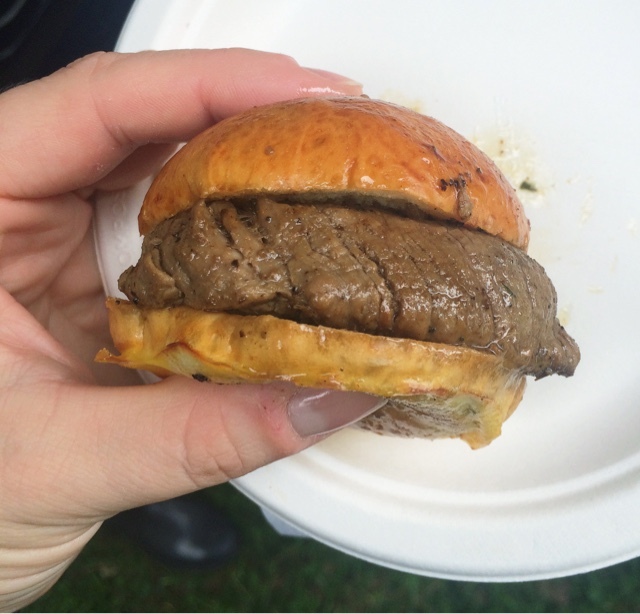 Gibson's Steakhouse was there serving up their signature filet sliders on buttery buns. These little bites were simple and decadent-- and the steak was perfectly cooked and tender. 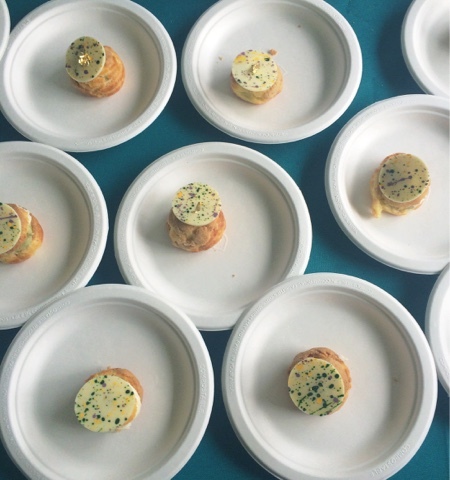 Nico Osteria's pastry chef was at the festival sharing some of the prettiest profiteroles. These pistachio profiteroles are a signature item on Nico's dessert menu and featured a rich cheesecake mousse as filling and a gorgeous colorful white chocolate piece on top. The chefs behind Element Collective (the restaurant group that owns Nellcote, RM Champagne Salon, and Old Town Social, among others) served another one of our favorite dishes of the day. 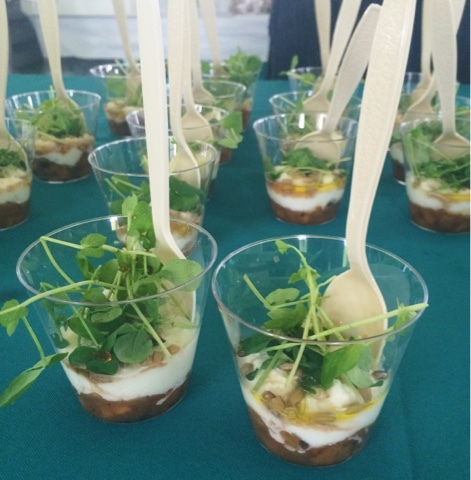 These savory parfaits were so lovely and consisted of roasted peaches layered with burrata, pea shoots, and toasted sunflower seeds. It was another simple, but brilliant combination of ingredients that worked together beautifully. 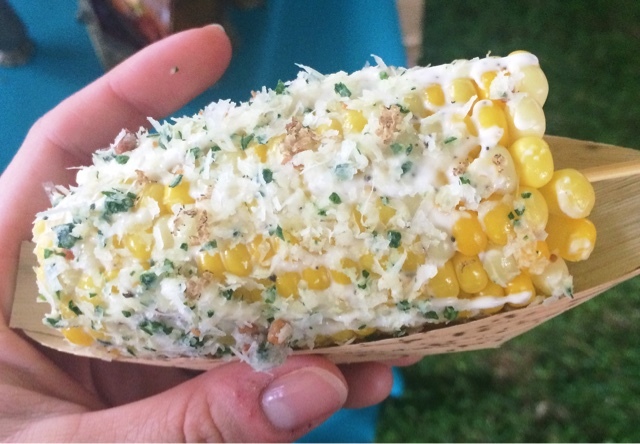 While those DIPies might have been the sweet highlight of the event for me, the savory highlight for me (and the other girls I was tasting with) was most definitely The Florentine's Italian twist on street corn. Corn on the cob was generously coated in a tangy aioli and then rolled in a combination of Pecorino Romano, trufflle, pancetta, and herbs. 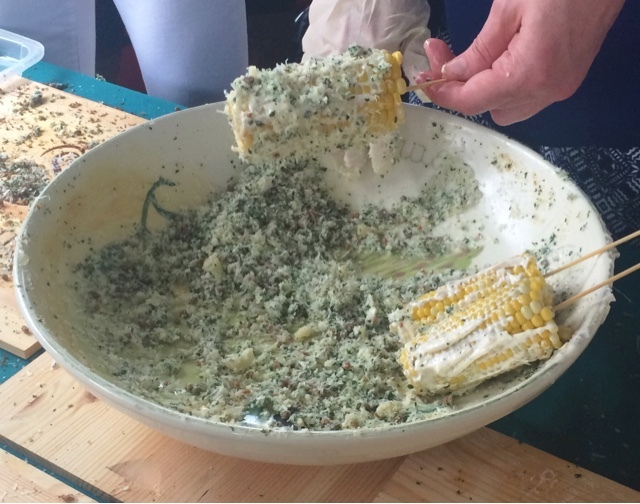 I never expected corn to be one of the most memorable dishes of the event, but this was a really special dish with bold flavors that worked wonderfully together. 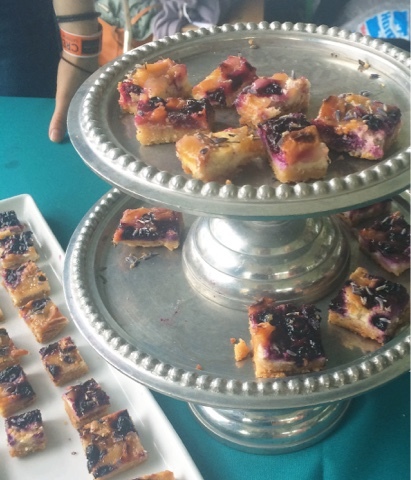 Floriole, a French bakery in Lincoln Park, served these wonderful and seasonally appropriate peach & blueberry pastries. And their table was one of the prettiest of the day too! And while a kale salad isn't often something you'd think of as being super special, this version by La Sirena Clandestina was really wonderful. 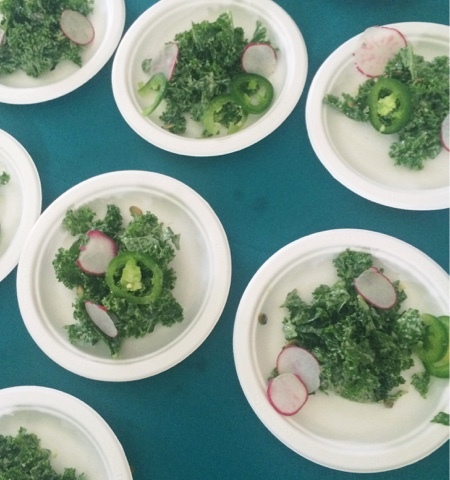 The kale was tossed in a fresh creamy vinaigrette with a hint of peppery heat and served along with thinly sliced radishes, jalapeno peppers, and toasted pepitas. It was refreshing and flavorful and a nice foil to some of the richer dishes we tried that day. When I saw the chef at Labriola's table shaving black truffles directly into a skillet of pasta, I knew I wanted to sample that dish. And it did not disappoint. Handmade gemelli pasta was cooked to al dente and tossed in a rich tomato ragu. 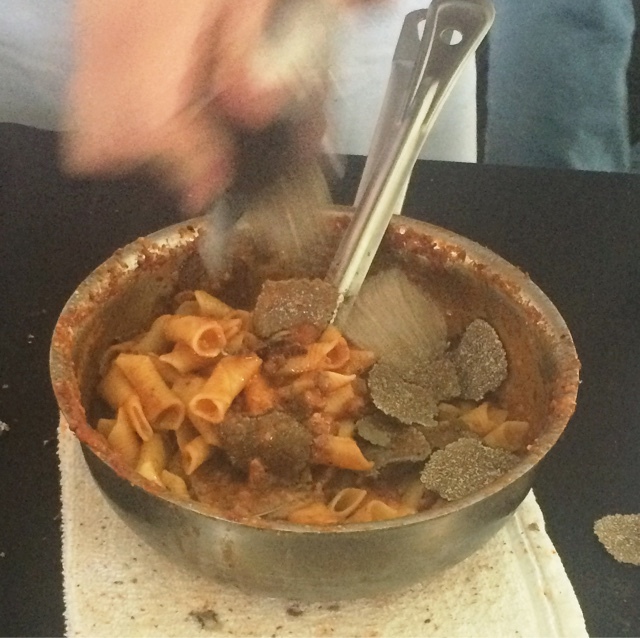 It was finished off with rich truffles for a dish that was flavorful, comforting, and decadent. And last, but not least: one of my favorite desserts, which was a collaboration of one of my favorite frozen treat purveyors and one of my favorite Chicago coffee shops. 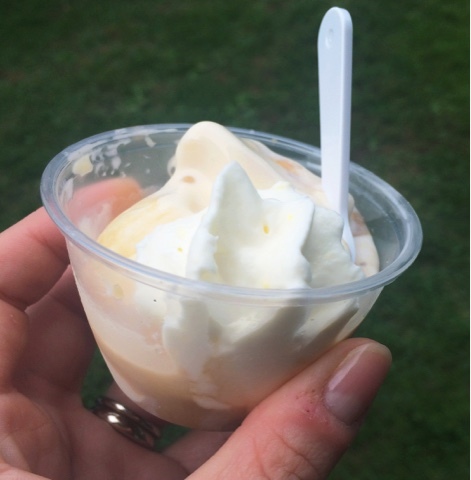 This affogato was a combination of sweet vanilla gelato from Black Dog Gelato and rich Bow Truss coffee topped with fresh lemon whipped cream. I love an affogato and this fresh and lemony version was one of my favorite dishes of the day. 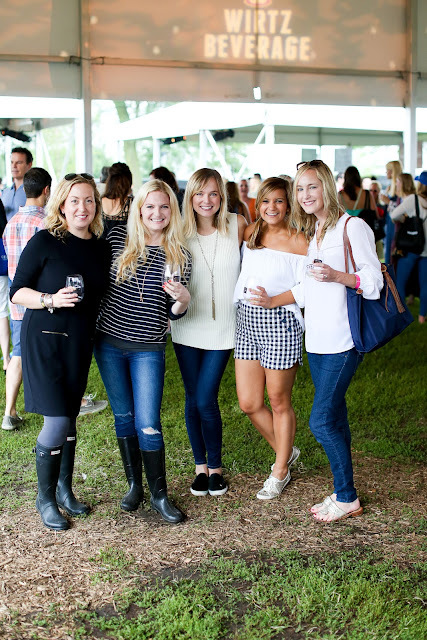 It may have been a rainy day, but we had such a wonderful time at Chicago Food + Wine! This festival was a great addition to the Chicago foodie scene and I sure hope that it returns next year. A Chicago vacation is a fantastic time waiting to happen! From the time you set foot in the city, there are lots of things to do, attractions to see, food to eat, amazing hotels. How are you everybody.Especially thanks to the blog admin for his/her wanderful blog.I want to let you know about my following writing. Chicago Myth Festival is a dynamic music festival designed for you and some friends or the entire family. This amazing Chicago even it typically hosted in beautiful Grant Park where you have lots of space. This is a gorgeous place, and I won't soon forget it. Attended an event here sponsored by the company. The reception hour was held in one of the rooms next to the event venue hall. I loved their buttery mashed sweet potato. Menu for a diabetic person just entail portion control, keeping insulin levels and healthy glucose and looking for meals everybody in the household will enjoy. After years of trying to learn how to prevent a hangover there have been very few solutions that truly work for me. Recently stumbled on to Detoxicated- hangover pills- and found that they work really well for me. As I believe everyone should be an educated consumer, you can check out more information on their website.